Been trying to catch this damn thing for over a year now with thousands upon thousands of casts and still no luck, the worst thing is a guildie got it yesterday after trying for 5 minutes :(. 450 fishing skill with +30 from my Bone Fishing Pole and using sharpened fishing hooks from the daily reward bag bringing my fishing skill to 580. After 90 Furious Crawdads, 3 Goldenscale Vendorfish, about 30 Golden Darters (and a few other things too) and many many pools later I got Mr. Pinchy. Unfortunately I didn't get the pet but hey, two charges left, fingers crossed! Got my Mr. Pinchy on the seccond Mixed highland pool. on 7th cast. I caught Mr. Pinchy last night while fishing in a school in the pond at Stonebreaker Hold. I hadn't cast but about 10 times when I caught him, and I wasn't even trying to farm him. My fishing skill was ~280 and I was using Nat Pagle's Extreme Angler FC-5000 with Bright Baubles, so my fishing was only ~375 (lol). I also got the Magical Crawdad Box on my second use of the Mr. Pinchy cooldown. I got Mr. Pinchy on 241st cast with 600 fishing skill, plus Weather-Beaten Fishing Hat and Jeweled Fishing Pole equipped. Started fishing in Lake Jorune and Lake Ere'Noru but the pools weren't respawning fast enough, so I flew over to Blackwind Lake and fished there for 2 hours, much better respawn rate on the pools. I decided to head out with a guildie and try to farm this little rare. In about 50 or so catches, Mr. Pinchy ended up in my bag! I was so excited! The first wish granted gave me the Magical Crawdad Box :) Now to go level him up. Happy Hunting! After roughly two hours of fishing from Highland Mixed School pools throughout Terokkar Forest (especially in the SE corner) I had Goldenscale Vendorfish and Mr. Pinchy both pop about 30 minutes apart from the same pool located near: 58.75 / 60.15. How about, before down-voting, go spend 20 minutes to fish up you're very own Mr. Pinchy to see the drop rate has been increased significantly! Go to Shattrath, then head southeast to one of the lakes in Terokkar Forest to fish for Mr. Pinchy*. Right-click Mr. Pinchy to "make a wish." You can try this every 4 hours, and you have 3 tries total per Mr. Pinchy. When he grants you Magical Crawdad Box, right-click it to learn the pet Magical Crawdad. There are at least 5 items you can be granted, and if you really want the pet, none of the other items will be cool at all, bro. I happened to get this on the first wish. * The map on the page for Magical Crawdad, which shows only one node where this item can be found, is misleading, since you can't directly fish for the item itself. Instead, you fish for Mr. Pinchy. His page will show you the possible places you can fish for him (3 lakes in Terokkar Forest), rather than just the one exact coordinate shown on the page for Magical Crawdad. I just got Mr. Pinchy after 96 casts. I also got Magical Crawdad Box on my first wish. The best place to farm for Mr. Pinchy is in Blackwind Lake near Skettis. Just fished this up on my 5th cast (600 fishing skill) in a Highland Mixed School near Allerian Stronghold in Terrokar Forest. Got Magical Crawdad Box on the first wish too. Supposedly this is incredible luck, but good luck to everyone trying for it! 1. The one you want, the Magical Crawdad Box is created in your inventory, or mailed to you if you were absent-minded and did not leave an empty bag slot when you used Mr. Pinchy. 2. Benevolent Mr. Pinchy, a temporary summoned guardian companion that will fight for you; kind of like the Winter Veil Yeti gift, but already summoned, and no charges. Think old school hunter pet set on "Aggressive". Oh, the fun you can have with that. His level and health scale with your level, but even at level 100 he has only 20Kish health. About as useful as Zoidberg. 3. Furious Mr. Pinchy, a hostile level 70 mob that spawns next to you. Does NOT scale with your level and drops no loot. One person commented that it can be Mind Controlled, for your amusement. Spawning it in the Dalaran fishing pool, then sheeping it, then leaving could be fun. 4. 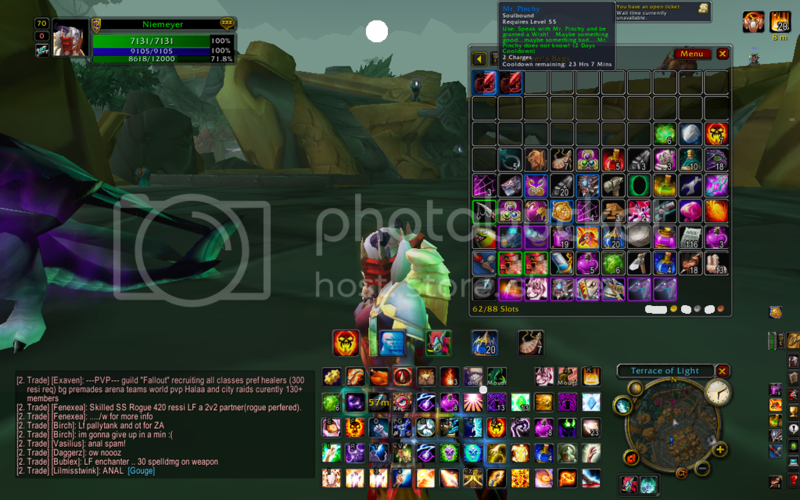 Mr. Pinchy's Gift, a gift box nominally containing some level 70 healing and mana potions, and a 2% chance to contain The 1 Ring. Comments report that it is broken, contains nothing, has been reported, and Blizzard has no intention of fixing it. No one seems to care much either way. Got Mr Pinchy after fishing in exactly 70 pools of Highland Mixed School or 176 Furious Crawdads later. So the person who mentioned that he got it after 172 Furious Crawdads was right on the spot. PS. Also as for many others, I got Magical Crawdad Box on my first charge. This item can be fished in Terokkar Forest (22).